There are days when you want nothing more than to drop the issues, ditch your parents and enjoy a Teen burger and root beer at the drive in. It’s 19xx and all the crowd is going to meet at the A&W. I might even get a date for the beach party too. Well that may be optimistic but I do have an empty seat and everybody wants to go! At the Sydney Shopping Center on Wednesday it all came back in memories and stories. Drinks spilt in Dad’s car; not enough money to pay; that idiot who backed into my car! Yah, likely he was so taken up with the girl beside him…. 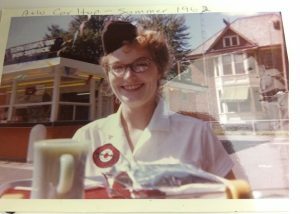 The summer jobs at the A&W and many other places; cars long gone and fondly remembered for their various features. The burgers are still great and the mug ‘o’ beer bottomless, though a 3rd refill was not likely to happen. And the cars were lined up catching the sun and lots of attention. The Lotus, B Mike, B Bill, B Don, B Alf, Tr6, Ol’Blue, the Crab, and the Alpine [Tiger at the wheel]; hey hey is that an A? And a vintage van soon to be replaced by a cheery red Wilf B. It took a bit of effort to leave the cool seats of the A&W and sit on the sun heated car seats. Our entourage was soon underway with Alf and Donna leading us on a mystery tour. Turn here, turn there, keep the car ahead in sight. Watch the other traffic, they may not appreciate this is a ‘step back in time’ parade of young kids bellies full and ready for the open road. We caught a few glimpses of the Mira from the north, east, west and south. Crossed it twice and managed to keep a decent lineup of vintage vehicles motoring through the countryside. From the houses there were waves, cheers, “there’s more”, WOW, and horns honked as we delighted the neighbours on a hot summer’s evening. To our delight the tour stopped in at Mullins and ice cream could be had – if you read the signs and followed the rules and paid etc. 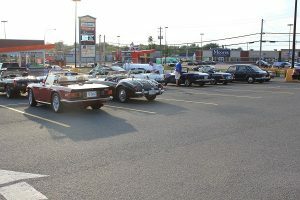 While we licked and lapped up the drips drivers answered questions and listened to others who had memories of old British cars. Well most got it right. But one guy said as he took a long look “I had one of those, I should have kept it” Bill e- ‘what British car did you have?’ “yah it was the green one, a 383 3spd 2 door.” Says I ‘maybe it was a Plymouth? ?’ Yah I guess it was, yah a Duster but it was old like these.” We bring happiness not accuracy. Everybody enjoys a moment in their memories and a happy reflection when it comes flooding back. Triggered by a sight, sound or smell [all if it’s British!] happy memories can mean a perfect end to a long day. As the sun set, engines roared to life and we dispersed for a sunset drive home. We flocked off in small bunches.